Surviving in the winter is one of the more challenging situations, especially for someone new to the survival lifestyle. Unlike warmer months, food isn’t as easy to forage for, and, depending on where you are, water may not always be liquid to be easily drinkable. Add on top of those difficulties the challenge of trying to start your garden so that you can have a consistent food source, and you have a challenge. While most garden crops, such as tomatoes, need to be started just six weeks before the last expected frost date, there are others that will need to be started as early as mid-winter if you expect to have a full harvest. Leeks and onions need to be started from seed indoors as much as 10-12 weeks before the last spring frost. Early cold weather crops that you’ll want to plant and hope to harvest before the mid-summer heat, such as broccoli, also might need to be planted well before your other seeds. Of course, to use these kinds of seeds while still making use of other types of crops that grow better in warmer seasons, you’ll want to take some time to plan your garden and your crop rotation. In other words, you’ll want to have an plan for what you will plant now while taking to consideration when you will harvest these plants and what you will want to plant next and when it will be ready to harvest, and so on. While going through this planning process, you may also want to allow some fallow time for your garden (or for rotating portions of your garden) so that the soil has the opportunity to replenish for the next cycle of crops. Wood ash, used in moderate amounts, makes excellent garden fertilizer. The ash is comprised of non-combustible minerals that the tree took out of the soil to fuel its metabolism. Those concentrated nutrients can go back onto your garden soil or into your compost to give both a boost. Wood ash can impact soil pH, so use in moderation. 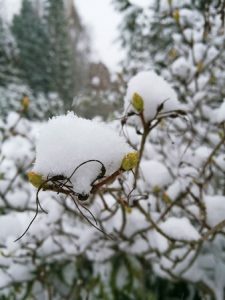 All-in-all, if you are serious about having a garden to feed your family, winter is a great time to get to work so that you can reap the rewards in the warmer months.